It was a back and forth battle between Anne Guadalupi of Cony, Tessa Cassidy of Brunswick, & Katherine Leckbee of Mt Ararat as the trio each had the lead at some point during the race as they tried to drop eachother. "It was mental for me at the end, it was hard." Guadalupi said of her winning effort today. Looking ahead to next week's state meet at Twin Brook, Guadalupi said " Running downhill is my strength, I need to work on going up." All three will be in the mix for the Class A individual title next week. 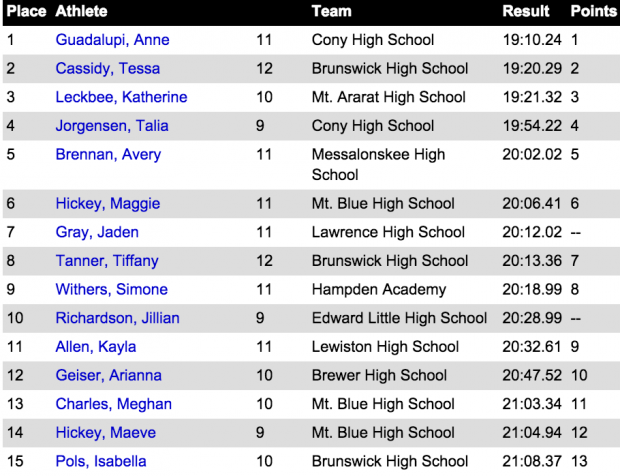 Cony freshman Talia Jorgensen who ran with the leaders early on finished 4th in a fine 19:54.22, while Messalonskee's Avery Brennan rounded out the top 5. Brunswick got revenge for their loss at the KVAC Championship last week as the Dragons easily won the team title 55-82 over Mt Blue. 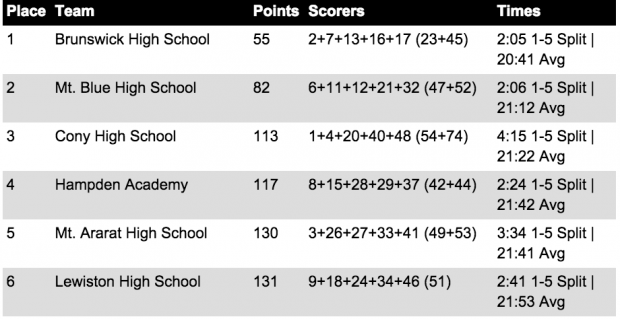 The Dragons were paced by Cassidy's runner-up finish, and an 8th place effort by senior Tiffany Tanner. They had all 5 scorers place in the top 19.